The impact of independence on NHS Scotland has caused some of the most impassioned debate in the whole campaign - despite it being a devolved issue. Objective analysis is hard to come by, but at least we now have some numbers, helpfully crunched by the respected Institute for Fiscal Studies. Nicola Sturgeon has said that a 'Yes' to independence would free the Scottish NHS from an agenda of privatisation and public spending cuts. The 'No' campaign focuses on what iScotland’s finances would mean for NHS funding. Gordon Brown has said he wants to 'Nail the NHS lie' of the 'Yes' campaign. The historical point IFS makes is that Scotland has not given the same priority the health spending as the UK, as this table illustrates. For the future they point to the likelihood of downward Barnett consequentials of UK spending cuts that will make it harder to protect NHS spending. Unless, the Scottish Government is willing to use their existing and new taxation powers - something they appear reluctant to do. Independence would give greater freedom to spend more, depending on the constraints of a currency union, should one be agreed. The capacity to do this depends on a range of assumptions over oil prices etc that are difficult to quantify. IFS has already set out their view on this, although it is challenged by Yes supporters, such as the Cuthbert's. IFS conclude that, "in the short term, then, it is hard to see how independence could allow Scotland to spend more on the NHS than would be possible within a Union where it will have significant tax raising powers and considerable say over spending priorities." They also say the longer-term outlook is more difficult for them to quantify, "a combination of the eventual fall in oil revenues and an ageing population could make for a tougher fiscal outlook for Scotland than the rest of the UK and hence less room for additional spending on things like the NHS." They concede this could be offset by faster economic growth in iScotland, but that is not certain, by any means. There are some mixed messages in the latest batch of NHS Scotland statistics. Workforce numbers are up last year, although still less than before the crash and vacancies are high. Some health boards are struggling to meet waiting time targets and most missed the four hour A&E wait target. Perhaps most challenging is increased bed blocking. The workforce statistics show that the total number of NHS Scotland staff in post increased last year with 135,881 whole time equivalent (WTE) and 159,058 headcount on 3 June 2014. The annual increase in staff of 1.9% WTE is mainly due to increases in nursing and midwifery (1,309.6 WTE), administrative services (345.5 WTE), medical (286.2 WTE) and allied health professions (226.4 WTE). Welcome though this year’s increase is, it’s worth remembering that the highpoint for NHS staff in Scotland was September 2010 when the WTE was 135,964. When the council staff transferred into NHS Highland are taken into account, the NHS is still around 1000 staff down since the financial crash. In addition, the total number of vacancies remains high. Consultants 346.7 WTE, a rate of 6.9%; Nursing and midwifery 1,865.3 WTE, a rate of 3.1%; Allied health professions 481.2 WTE, a rate of 4.1%. The Health Secretary argues that this is a mixture of hard to fill specialists and increasing staff numbers. Others suspect that some health boards are balancing their books by deliberately not filling vacancies. 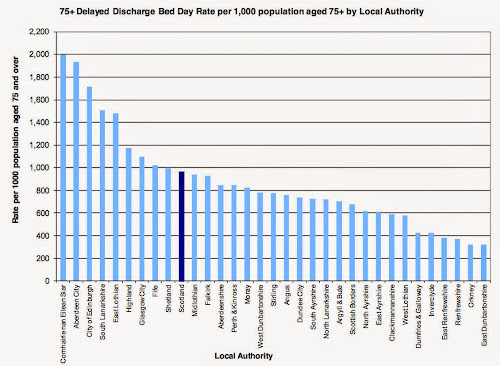 The statistics on waiting times and bed blocking highlight significant regional variations. Grampian, Lothian and Forth Valley missed a target to treat the majority of people within 18 weeks. Only two health boards managed to treat most patients in A&E departments within four hours. Five health boards missed an interim target to treat 19 out of 20 patients within that time frame. Only five of the 14 health boards have achieved the 26 week waiting time for treating children and young people who need care for mental health problems. 175 patients remained in hospital six weeks after being fit enough to be discharged. The main reason given was the lack of a place in a care home. The target is that no patient should be delayed in hospital for more than four weeks and that will fall to two weeks by April next year. 518 patients are waiting more than two weeks at present. 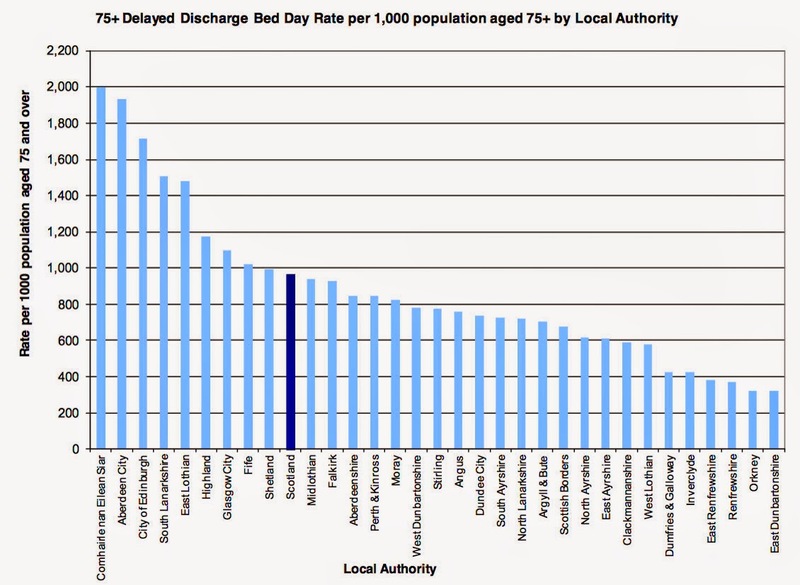 In total, nearly 900 patients are in hospital when they have been assessed as ready for discharge - the equivalent of Scotland’s largest hospital. All these numbers have increased over the last year and exclude the 300+ patients classified as Code 9, which means there is an approved cause for their delayed discharge. Interestingly, there are significant regional differences as the chart below highlights. This will be a key challenge for the new integration boards. Some sad news that our Vice-Chair Ali Syed has passed away after a long illness. 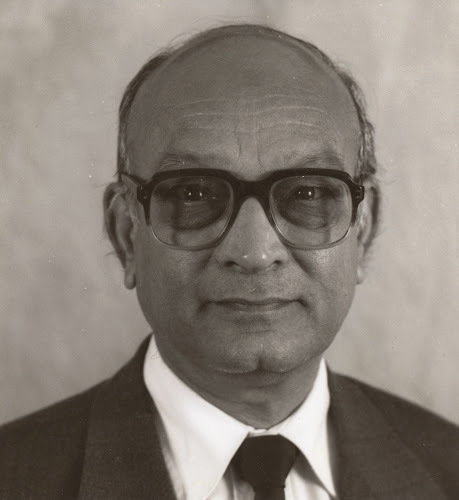 Ali was a stalwart of SHA Scotland for many years, serving as Chair and then in retirement as Vice-Chair. He also served on the SHA UK Central Council. He had an outstanding NHS career in cancer care, latterly at the Beatson Centre in Glasgow. Ali was a trade union activist for many years holding a range of posts in UNISON health branches and in Glasgow Trades Council. His trade union values shone through in all his work, including the many causes he took up - not least the plight of the Palestinian people. He was Labour to the core and made many contributions at Scottish Labour Party conferences - even when he wasn't even a delegate. Nothing stopped Ali when he had something to say! He will be sadly missed by all his comrades and the very many people he helped. Our thoughts are with his family. He will be interred at Glasgow Central Mosque at 1:30pm on Tuesday 26th August. It is perhaps surprising that a devolved issue, the NHS, has become the latest 'battleground' issue in the referendum campaign. The Yes campaign, desperate to move away from the currency issue, are issuing press releases almost daily on the issue. Apparently, only a yes vote will save the NHS. There appears to be two grounds on which this claim is based. Firstly, that the English NHS is being privatised and therefore this will be forced on Scots, who have rejected the marketisation of health services. The primary difficulty with this argument is that the NHS is a devolved service, so it's the Scottish Parliament that decides the structure of the NHS. And that's exactly what they have done. Dave Watson's blog on this site reminds us how that happened, not by an SNP administration for whom falling out with Westminster is compulsory, but by Scottish Labour ministers who went in a different direction to that of their UK counterparts. The minister who we have most to thank for that is Malcolm Chisholm. The MSP respected even by his political opponents and the least likely to follow the party line on anything. His view of the Yes campaign argument is: "This has to be not just the biggest lie of the Referendum campaign but the biggest political lie of all my years in politics." Somewhat ironically, if there is a threat to the NHS as a public service it comes from the EU and the proposed TTIP treaty with the USA. But of course the Yes campaign will not have us exiting the EU. It would also possibly be churlish to point out that spending on private health care by NHS Scotland has increased by 37% since the SNP came to power. The second argument is that a privatised English NHS will result in a cut in spending and therefore a consequential cut in Scotland's NHS through the Barnett formula. There are frankly more holes in this argument than a Swiss cheese. Anyone who has studied market driven health systems knows that transaction costs increase. More money is spent, not on care, but on administration. The SNP trumpet the £1bn efficiency savings target for the English NHS, that they claim means £100m taken from the Scottish budget. They forget to mention that NHS Scotland also has efficiency savings targets, but as in England they get ploughed back into the NHS. The net result is no budget cut and therefore no Barnett consequentials. Even if there was, the consequentials would be for the Scottish budget as a whole, not the NHS in Scotland. In fact, the opposite has been the case. 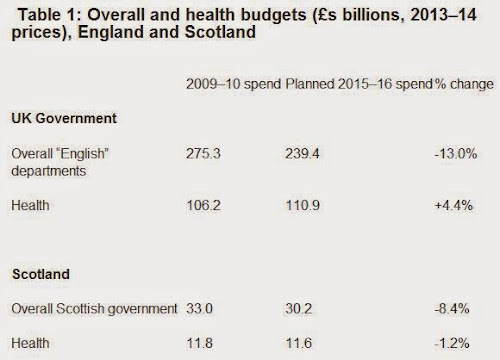 Because the Tories have largely protected health spending in England, Scotland's budget has not been cut as much as UK budget as a whole. Small comfort, but it does demonstrate that even the Tories recognise that cutting health spending is electoral suicide for them in England. As the Scottish Government explanation for the Scottish health budget increase says, "This is the full amount of the budget consequentials arising from the increase to health in England and delivers on the Scottish Government’s commitment to pass on the resource budget consequentials in full to the health budget in Scotland." For an objective view on these points you can read the ITV or the BBC analysis, amongst many others. Even Yes leaning academics have pointed to the huge flaws in the argument. If there is an argument here, it is that the Tories do want to roll back the state with their austerity programme. But that is a political choice that voters across the UK can reject. There is also the small matter of how Scotland's finances might look after independence. A valid debating point, but not specifically about the NHS. There are many valid arguments for independence and SHA Scotland has covered these in its latest journal. However, the NHS arguments are hugely cynical, the Yes campaign's version of 'Project Fear'. Cynical because most people don't understand how our services are structured and financed, but they do value our NHS. The referendum debate deserves better from those who understand these matters all too well. Happy 66th Birthday to the NHS in Scotland! While the NHS is great at treating illness, the greatest health challenge in Scotland is health inequality. That requires coordinated action across our public services. To commemorate this birthday, UNISON Scotland has published a paper on health inequalities in Scotland. I drafted this paper as our submission to the Health Inequalities Review commissioned by Neil Findlay MSP. The review starts from the premise that Scotland’s health inequalities are the unjust differences in life expectancy and these differences are determined by socio-economic position, caused by the unfair distribution of income, wealth and power. Tackling this inequality is arguably the greatest challenge we face as a society. Overall life expectancy has increased in Scotland in recent years, but continues to be closely associated with deprivation. The average life expectancy of men living in the least deprived areas remains around 11 years higher than in the most deprived areas. There have been many reports describing this problem, but less focus on solutions. That's why this paper focuses on policy recommendations that we believe could make a real difference. We start with the structural changes that are needed to break down silo working. We need to assess every policy against national indicators on health inequality, but it is at local level, working through Community Planning Partnerships where joined up working needs to become a reality. As Christie recommended, staff and service users should be fully engaged in delivering positive health outcomes. While health inequality requires cross service action, that doesn't mean we should ignore health actions. The paper sets out a range of actions that address public health concerns around smoking, drugs and alcohol. Social care in Scotland is a national disgrace and much more needs to be done on improving mental health. We also need to ensure that NHS resources are targeted on areas of greatest deprivation. The NHS must be at its best where it is needed the most. Finally, we set out a range of broader actions. These include action in the workplace through occupational health, health and safety, and measures to tackle worklessness. Improving our environment through design, better housing, sustainable transport policies, as well as measures to tackle climate change. Preventative spending should be at the core of our approach with quality early years provision, followed throughout the education journey to further and higher education. Eradicating fuel poverty is vital to health inequality. That means raising incomes, freezing energy prices and effective energy efficiency measures. UK child poverty rates are predicted to rise to 24% by 2020, resulting in an additional 50,000 children in Scotland living in poverty. So welfare reform and increasing wages are an essential element of this strategy. A comprehensive strategy starts with a recognition that health inequalities are caused by socioeconomic inequality. Building on that analysis, we must take action to narrow wealth and income inequality, not just increasing income at the bottom. Other actions require a new structural approach that places health inequalities at the centre of public policy, leading to a range of practical measures that can alleviate and then eradicate health inequalities.